This hypothesis–theory distinction seems to be of Wotton’s own making. It is an effective means of dealing with the problem of the utility of hypotheses in a climate in which the notion of hypothesis was, to say the least, on the nose. Wotton spouts the standard anti-hypothetical rhetoric – the hypotheses of Descartes and others are mere chimeras ­­– but he is not insensitive to the fact that experiments and observations on their own are not sufficient for the advancing of true explanations. Wotton was not an experimental philosopher. Rather, his Reflections was written as a defence of modern learning, and, in particular, the experimental philosophy, in the battle of the books. His comments and those of Baker, are therefore, indicative of the reach of the methodological stance of experimental philosophy beyond the writings of natural philosophers themselves. So far, we have argued in many posts that British philosophers from the 1660s onwards worked in the tradition of experimental philosophy and criticized speculative philosophy. However, the distinction between experimental and speculative philosophy was also widely employed outside the British isles. In this post, I will document the presence of the experimental-speculative distinction in Italian natural philosophy between 1667 and 1716. We would not like anyone to believe that we presume to give to the light a complete work, or even only a perfect scheme of a great experimental history, because we know well that more time and strengths are required for such an enterprise […] if, sometimes, an even minimal allusion to anything speculative has been made, […] always take it to be a specific idea or intuition of [some] academics, but never one of the Accademia, whose only aim is to experiment and to narrate. Note the emphasis on experiments, the references to natural histories, and the refrain from endorsing any speculation. These are all indications that the Academy was presenting its work in terms of the then nascent distinction between experimental and speculative philosophy. On the one hand, theoretical or “purely speculative” philosophy “needs experimental [philosophy] to “see [things] by means of the senses”. On the other hand, “purely experimental” philosophy must seek the help of speculative philosophy to proceed from particular experiences to their causes. [E]ither [philosophy], by itself, can be defeated if the other does not help and rescue it when it may fall down. But if both are united and if they fight side by side, although they may not always win, surely they will never be defeated. Among the Aristotelians, Giovanni Battista de Benedictis (writing under the pseudonym of Benedetto Aletino) criticized experimental philosophy for its inability to proceed from facts to causes. He claimed that experimenters were not philosophers, but mere empirics, because they failed to establish any evident, undisputed premises as the basis for a deductive scientia of nature. Indeed, if our Peripatetics, who only paid attention to speculative subtleties, had followed Aristotle’s teachings by directing their efforts towards experience, I have no doubt that they would have unfailingly attained the glory that the Atomists [i.e., experimental philosophers] are now seizing, not because of their knowledge, but because of the neglicence of others [the Peripetetics]. While Aletino defends the Aristotelians, he categorizes them as speculative philosophers and he rejects experimental philosophy. One makes hypotheses to establish [new] ideas and experiences; but hypotheses last only until phenomena modify or destroy them, or until a more perfect art of comparing truth-likely [statements] proves their uselessness or their imprudence. Like Bartoli, Conti endorsed experimental philosophy without wholly rejecting the speculative approach. Bartoli and Conti, like Aletino and the compiler of the Saggi di naturali esperienze, thought of natural philosophy in terms of the experimental-speculative distinction. As in the British isles, so also in Italy the experimental-speculative distinction provided important terms of reference for thinking about nature in the late seventeenth and early eighteenth centuries. In this post, I have not discussed to what extent the experimental-speculative distinction shaped the contents, besides the rhetoric and methodology, of Italian natural philosophy. I must do more work to answer that question. In the meanwhile, let me know what you think in the comments. This is a guest post by Ian Lawson. Robert Hooke knew how light worked. 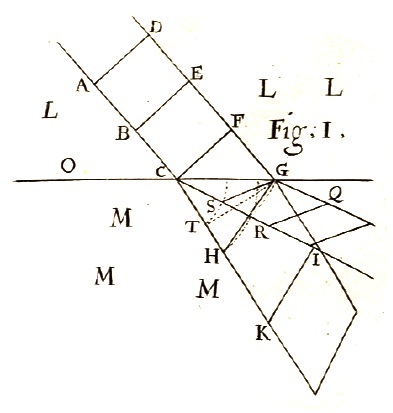 He worked with the stuff day in day out during the early 1660s and in Observation IX of his Micrographia (1665) he presents quite a systematic theory of optics. He presents his theory as the result of a startling observation about the colours of the rainbow observable in thin sheets of muscovy glass (mica). This observation he takes to be an ‘experimentum crucis’ against Descartes’ optical theory, ‘serving as a Guide or Land-mark, by which to direct our course in the search after the true cause of Colours’ (Micrographia, p. 54). His positive thesis starts by outlining a hypothesis about light based on some widely accepted principles (though I won’t go into the details here). This hypothesis he checks against more evidence, this time a glass globe filled with water. He finds his idea consistent with the phenomenon, while Descartes is again lacking. An ‘instantia crucis‘ this time – a sure sign he’s on the right track (ibid., p. 59). To refine his theory, Hooke continues experimenting. Now he uses water in a long glass tube and sheets of muscovy glass split to varying thicknesses. He adds detail until he feels he can account for all kinds of colour phenomena. ‘By this Hypothesis there is no one experiment of colour that I have yet met with, but may be, I conceive, very rationally solv’d, and perhaps, had I time to examine several particulars requisite to the demonstration of it, I might prove it more than probable…’ (ibid., p. 69). Hooke presents his theory in an ordered and structured way. First he disproves the leading existing theory, then puts forward his own hypothesis. He returns to experiment to check factual adequacy, and uses further trials to refine the general idea. Focusing on his theory as it is presented, though, makes several features of his account mysterious. Why is it tacked on to the end of an observation about colours in a mineral? Why should colour even be the main part of an optical theory? And given that it is, why does he never mention prisms? 4. Glass vials filled with water. Prisms, that paradigmatic optical experimentation device used by Descartes, Boyle, Power, and Newton in their experimenting about colour, are conspicuous by their absence. Rather, all of the experiments mentioned by Hooke are, in fact, part of his everyday set up for making microscopical observations. Numbers 2) and 4) are simply water microscopes, which he mentions using in the Preface to Micrographia. Number 3) is a scotoscope, used for concentrating light rays onto a small area to provide illumination, and also described in the Preface. And number 1) was Hooke’s preferred choice of microscope slide, as he explains when recounting his replication of Antoni van Leeuwenhoek’s observations in the late 1670s. 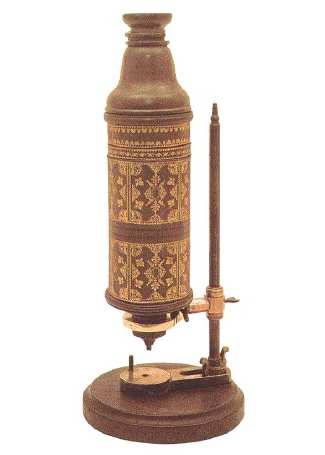 It is unlikely that someone in possession of mica, ornate microscopes, and with connections among the fellows of the Royal Society as well as the instrument makers of London, was unable to obtain prisms with which to make experiments. What is more likely is that, having spent four years making microscopical observations, Hooke stumbled again and again upon the incidental production of colours by his instruments. Chromatic aberration was a well known problem in microscopes and telescopes, which would not be solved until Dollond’s innovations in the eighteenth century. But using muscovy glass for specimen slides, and a water globe for illuminating his subjects, exposed Hooke two forms of colour production others may not have noticed. What’s more, in his Preface Hooke provides not only a detailed drawing of his primary instrument, but instructions on how it is made, and other versions suitable for other situations. 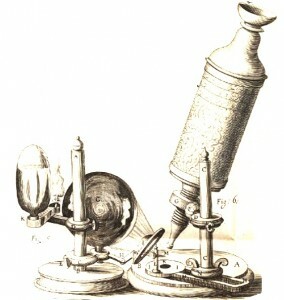 Hooke doesn’t seem to have thought of his microscope as a static, finished product. Rather, he used one instrumental set up to make observations of distant objects such as the moon, and another to view things nearby and in his control. Even this could vary depending on whether the subject was translucent or opaque, and on the amount of light required to illuminate it. He notes trialling lenses made not just of glass, but resin, gum, oil, salt, and arsenic. 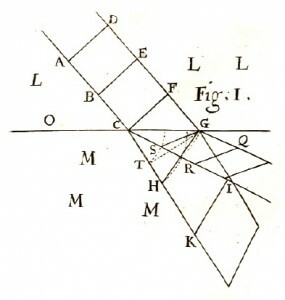 All of this points to a man very aware of the behaviour of light and the process of refraction by which objects are magnified, and who was able to alter his instruments for the best results. Some features of his theory are better explained by noting this likely route to Hooke’s knowledge of light, but a perhaps more difficult historical question is raised. Why did he present his observations as a constructed, systematic theory of colours rather than simply part of a history, as Boyle had done the previous year? It is likely the answer has something to do with ambition and rhetoric, and the role both Hooke and the other Fellows thought Micrographia would play in the early days of the Society.